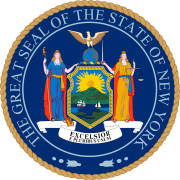 The 1817 New York gubernatorial election was held in April/May 1817 to elect the Governor and Lieutenant Governor of New York. Idle No More: Protest to Change? Governor Daniel D. Tompkins was elected Vice President of the United States in November 1816; he resigned in February 1817. Article XVII of the New York State Constitution of 1777 said that "...as often as the seat of government shall become vacant, a wise and descreet freeholder of this State shall be, by ballot, elected governor,...,which elections shall be always held at the times and places of choosing representatives in assembly..." This meant that, whenever a vacancy occurred, the Lieutenant Governor did not succeed to the governor's office but administrated the state only until the end of the yearly term of the New York State Assembly on June 30, the successor being elected in April. Porter did not run for Governor, but the Tammany organization, which opposed Clinton, distributed ballots with Porter's name in New York City, and a few were cast.